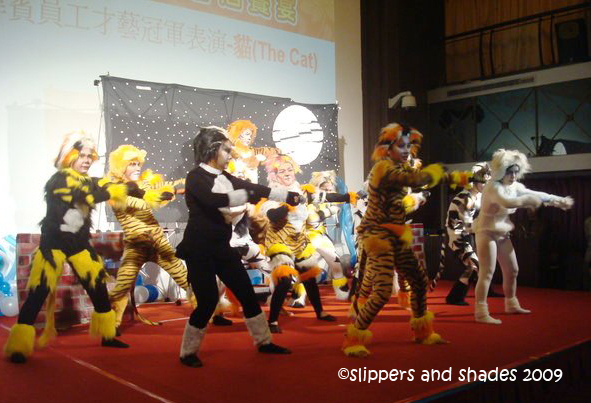 We, the members of the “CATS” grand prize winner were all excited as we boarded a hired bus going to Leofoo Village Theme Park in Guanxi Town of Hsinchu County. This is part of our Taiwan tour for winning in our 2008 Christmas Party in Manila, another surprise treat apart from our four-day tour in the northern part of Taiwan. This is our fifth day in the country and I observed everyone was still empowered by intense energy, ready to indulge for another day’s relentless adventure. 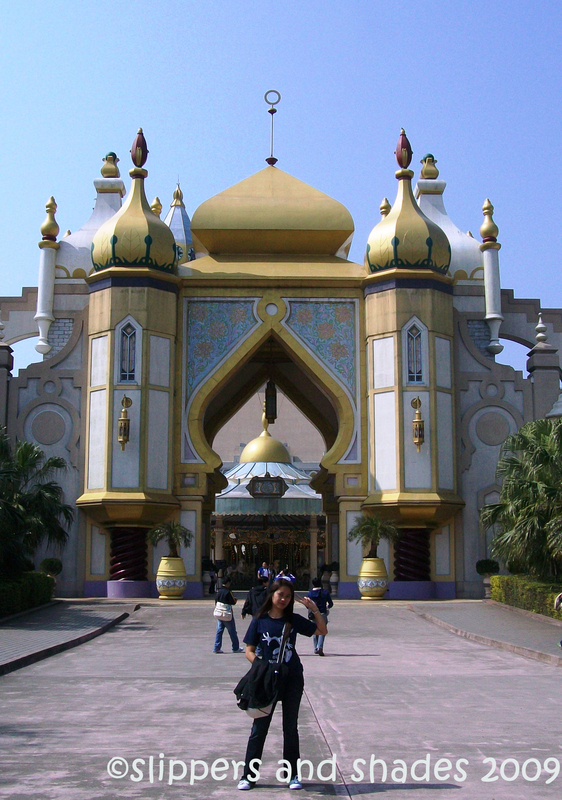 Leofoo Village Theme Park has four theme areas: Arabian Kingdom, African Safari, South Pacific and Wild West. 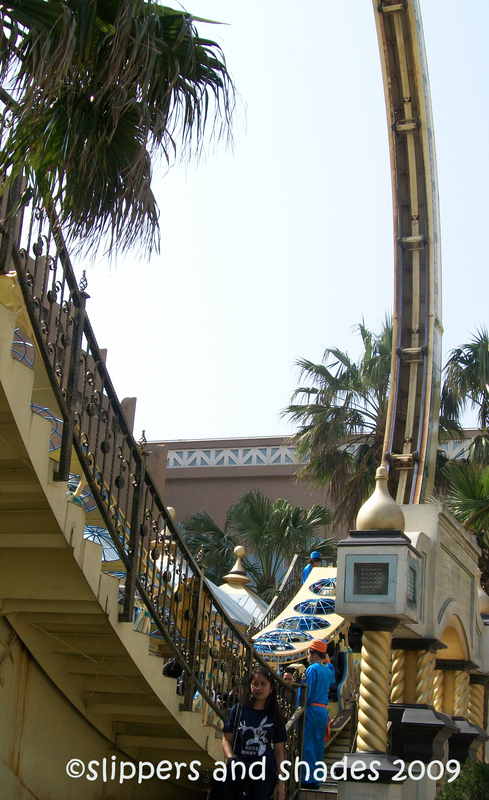 Every area offers thrilling rides that surely everybody will really have a good time. 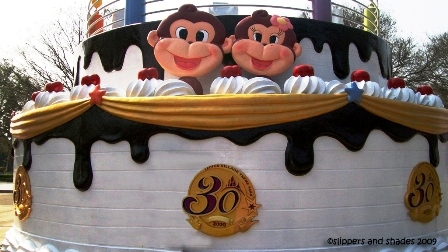 We were welcomed by a yummy giant cake (how I wish it was really a cake) with the theme park’s cartoon logo and the prominent number 30, indicating its number of years in operation. What we first explored was the magical-themed area Arabian Kingdom. The sight of the captivating Arabian Castle was amazing. The man-made knee-level lagoon added a scenic view. We’ve been snatched away from reality to a fantasy world in our Arabian journey with Ali-Baba and the Forty Thieves and the royal Flying Carpet of Alladin. Top attractions are Ring of Fire, Flying Horse and Sultan’s adventure. The boys had their first ride at Ring of Fire. It was a big metal circle where riders will enjoy the 360 degrees continuous loop. No one from the girls brave the ride. The boys screamed so loud as they turned up side down. When they set off, we were all laughing while they shared their funny experience. Where I enjoyed the most was the ride in Sultan’s Adventure. From the main entrance we walked inside a spooky underground. We rode in a treasure hunter’s jeep, and there we started screaming as we banged to every door which was loaded with lots of surprises. There were mummies, monsters, snakes and dragon. The desert night adventure was filled with screams and laughter as we jolted, shook from side to side, went up then dipped down. It was an unpredictable and spooky ride but full of so much fun. You better try it! Flying Horse is for little kids to enjoy. I felt we were so young when we went inside the beautiful grand palace. We had a better view of the lagoon and the Arabian Castle as we toured by Pegasus, the lovely white Flying Horse. 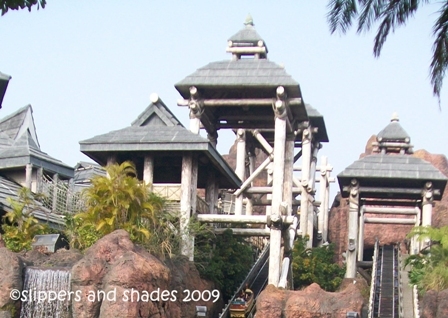 In this tropical-themed area is where we experienced heart-stopping rides like the top attractions Mighty Mountain Flume Adventure, Pagoda’s Revenge and Intamin Drop Tower. The creativity behind the design of Mighty Mountain Flume Adventure was fantastic. I braved this ride because Sir Remel was with me. We were given rain coats before we ride in a canoe. I was in the backseat, a bit scared because it had no safety provision such as seat belt or any harness that will prevent the rider from falling. We embarked on a journey where at first I got so excited in the first slide. But when we were ascending to the top of the volcano I got terrified so I closed my eyes and held the edge of the canoe so tightly. I felt my spirit was left out of nowhere when we plunged so fast into the pool level. When I opened my eyes we were back in a smooth ride again. The experience was a combination of excitement and fear. But one thing for sure, I will never be persuaded to ride in here again. Hahaha! 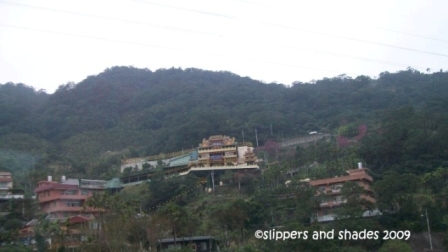 Pagoda’s Revenge is a 17-storey gravity floor ride where one will be taken up slowly to the top and will enjoy gazing a wonderful view of the Leofoo Village. Funny, when I was young I was so excited riding at heart-stopping attractions. Things changed when I have my two kids now. I don’t have the courage to try this ride anymore. What I did, I just watched my office mates screaming so loud while they were nearing the top and again there were another crazy screams as the gravity pulled them down so fast. Another wonderful experience guys. Hahaha! 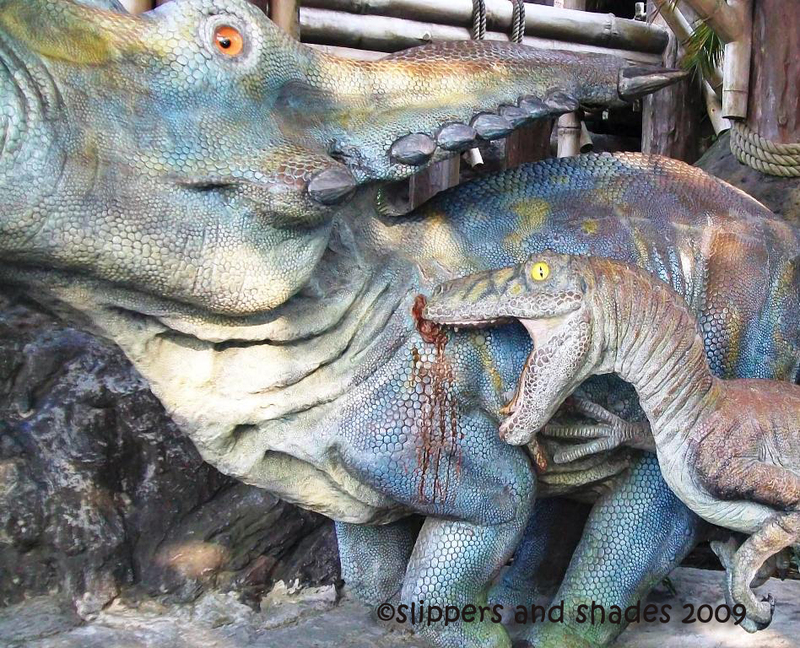 The Lost World is a visit to the Jurassic world where we indulged ourselves walking in a trail with lots of dinosaurs to see. There was a tree house at the top of the hill where we enjoyed viewing the entire Leofoo Village. 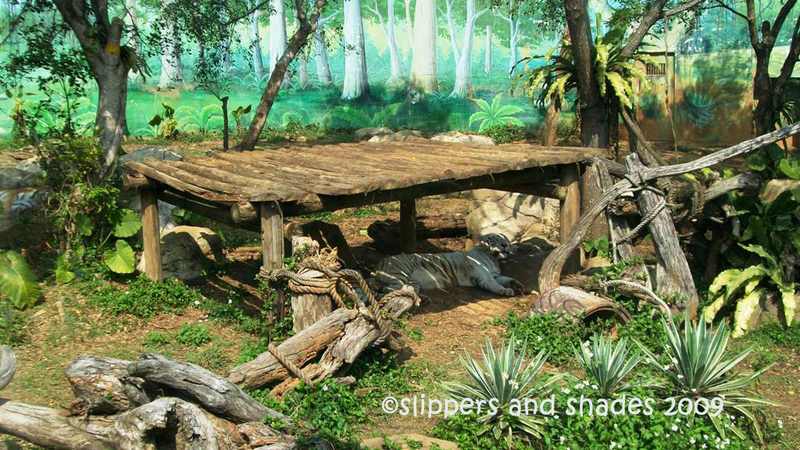 African Safari is a wild-safari-themed area where animal attraction could be seen. Carnivora Area’s Tour Bus. We rode in an air-conditioned tour bus going inside the carnivore area. 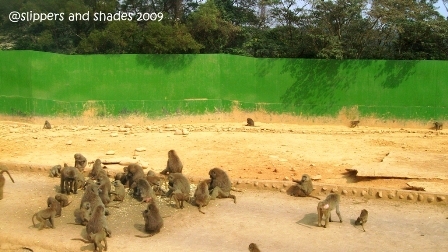 This was my first time to see great number of monkeys with African Baboon and orangutans, white tigers and black bears. 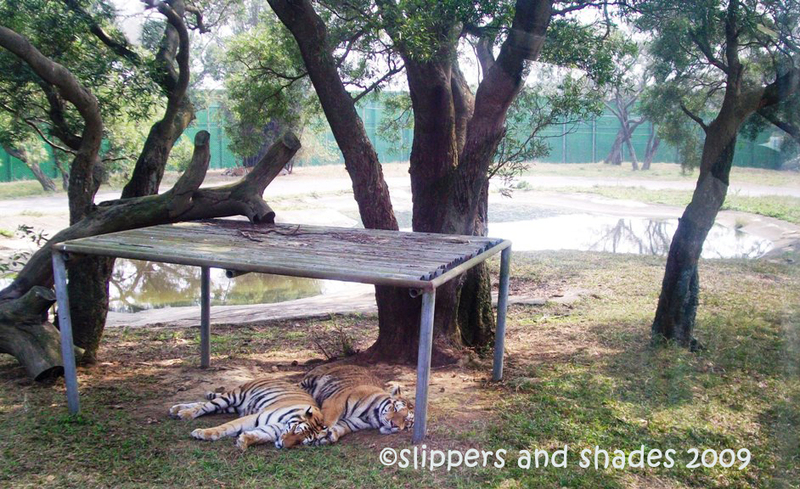 Yellow tigers and lions were in sleeping mode. We enjoyed touring a real-life African style safari in this park. Monkey Trail. After our Safari Tour, we tried the Monkey Trail. It is a mounted bicycle where we encircled atop the Primate Sanctuary. Ellen and I were partners as we paddled cheerfully ahead of our office mates. 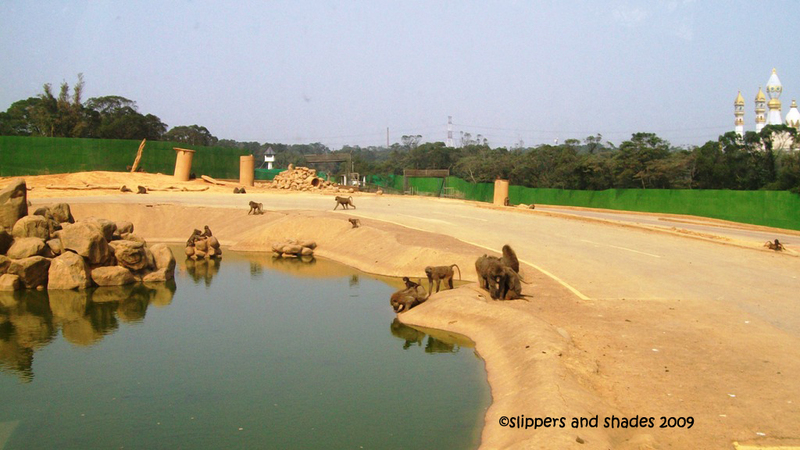 It was so delightful to see again great numbers of monkeys ruling in their kingdom. Wild West is an old theme wild west area with lots of live shows and thrills. 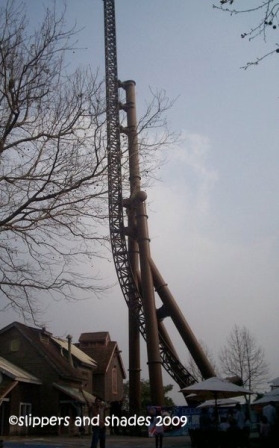 The top attraction is the inverted coaster called the Screaming Condor. Other attractions are the Little Rattler and the Big Canyon Rapids, where you will get wet in a river rapids. Screaming Condor is an inverted launcher and another heart-stopping ride where it will bring thrill and excitement to riders just like an eagle flying up into the sky. Big Ganyon Rapids Ride. This is said to be the largest man-made canal in Taiwan. The nine minute-river adventure was fun and fulfilling as riders enjoyed surprising treats in every corner with plenty of rapids and hidden rocks. 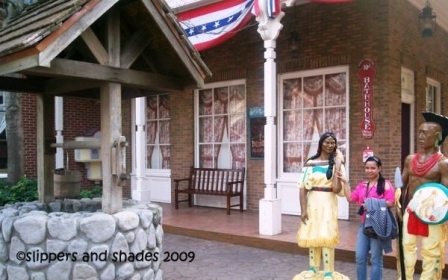 There were canteen inside the theme park and souvenir store to which we bought pasalubong to our family and colleagues. We had so much fun. We only had difficulty in talking to Taiwanese staff but thanks to our bosses for patiently translating English words to Mandarin. We were so thankful to our company for this wonderful break. CATS enjoyed so much! Cash and trip to Taiwan were our prizes for winning the grand prize in our 2008 Christmas Party musical dance contest which was held in a prestigious hotel in Manila. 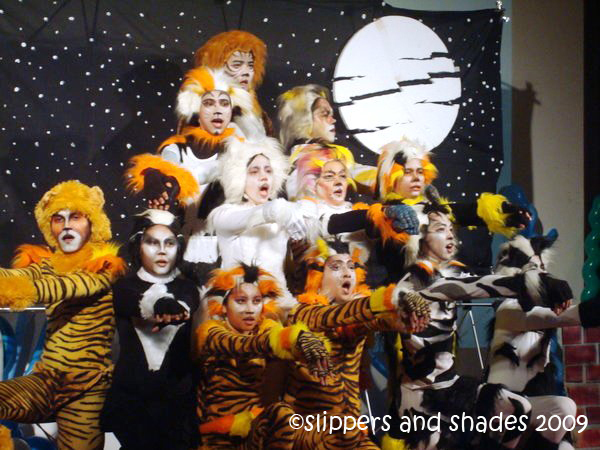 We performed Andrew Lloyd Webber’s the “CATS”. As the organizer of our group, it was an overwhelming feeling that for two consecutive years, the Central Area did it again! We were equipped with thick jackets as we head off to our six-day exciting vacation in Taiwan as February is a cold month in that country. We arrived in our hotel almost six pm. After our dinner we headed to Shilin Night Market which was often considered to be the most largest and famous in Taipei. We rode in MRT (Tam Shui Line) and stopped at Chien Tan station. We had a long walk going to the market. T-shirts, souvenir items and even foods were at affordable prices. I bought t-shirts for my family and souvenir items for me and to my colleagues. What I enjoyed eating here was the frozen sweetened strawberry threaded in a wooden skewer. Though it was very cold outside, we didn’t go back to the hotel yet after our market tour. 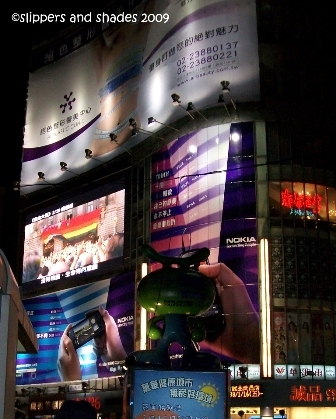 We explored the busy streets of Taipei and mingled with the crowd. The city lights were beaming. Funny, we ate ice cream albeit the cold weather. I shared a room with Elena and Esther. Time for bed! We headed to North Taiwan to visit our company’s branches. We were so excited as we passed the Hsuehshan Tunnel, the longest tunnel in the country. The long drive wasn’t boring and I was widely awake watching mountainous landscapes in the glass window of our bus. It was like we were heading to Baguio City. It’s good that most of our branches were located in shopping malls. From our last store to visit, I bought my favorite Transformer collections, Optimus Prime and Bumblebee for 635 NT with approximately P700 if converted to peso. Not bad. We had our dinner in a shabu-shabu restaurant near our hotel. After a little rest in our room, off we went to nearest stores and did some shopping. The day’s activity was visiting our branches again in Taipei. What we favored for the day was riding in a giant Ferris wheel in Miramar Department Store. 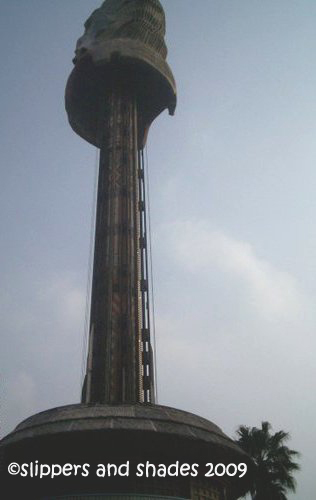 It was operated by afternoon. Since it was for free, every one experienced a wonderful ride. What thrilled me the most was visiting the reining highest building in the world, Taipei 101. 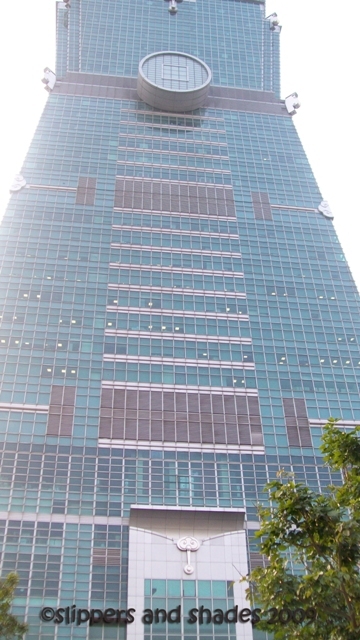 The building had 101 floors above ground and five underground. First few floors were filled with stores of foreign luxury goods. There were supermarket and food court underground. We went to the observatory deck in the 89th floor by riding the world’s fastest elevator. When the elevator closed, the lights were automatically turned off. We were amused and delighted seeing stars and constellations illuminating in the ceiling. The attendant served as a tourist guide as he was talking about the “Elevator”. He talked so fast, as fast as the ride. As he stopped talking, the door swung opened. The experience was pretty cool. There were so many good things to see at the observatory like pictures, reading material behind the construction of the building and lots of tourists that flocked on the deck. 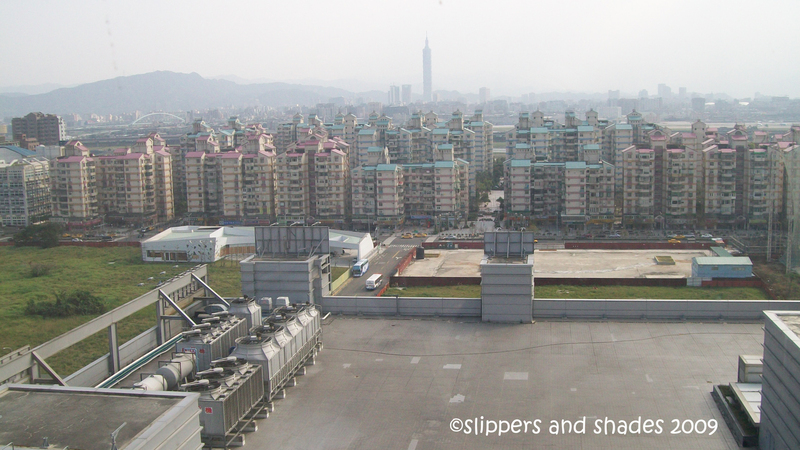 We’ve seen Taiwan in its afternoon glory from the glass wall. We stayed there until darkness engulfed the entire city. We proceeded to 91st floor, went outside and enjoyed the cool breeze. It was a chilly evening. 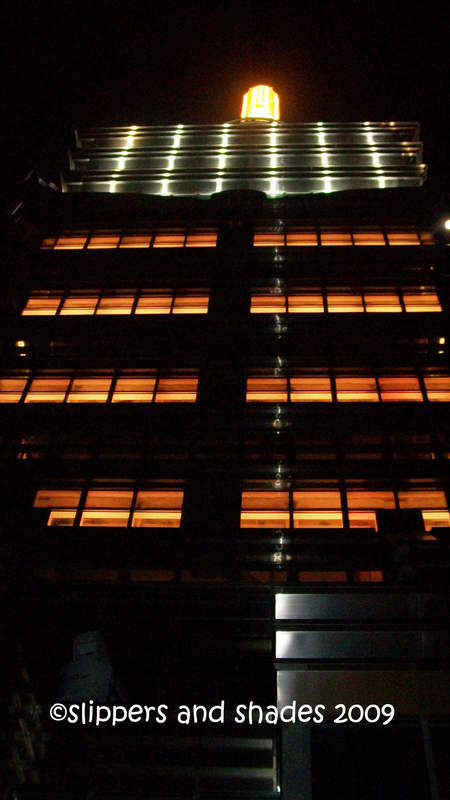 We had a good time viewing the top portion of the building where it was brighten by glistening lights. Our company was so generous for providing us a good break. Though we were so tired, the experience was all worth it. We had a good nice sleep tonight. 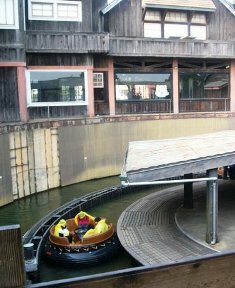 Another wonderful experience was our tour and ride at Loofoo Village Theme Park which was located in Guanxi, Hsinchu. It had four sections, Wild West, Arabian Kingdom, South Pacific, Zoo and Safari Park. 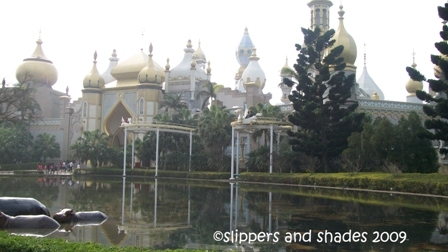 What we enjoyed most in Arabian Kingdom was riding in Sultan’s Adventure which was a high-speed jeep dark ride. Other exciting rides were Mighty Mountain Flume Adventure, Pagoda’s Revenge, Screaming Condor, Intamin Drop Tower, Ring of Fire, Flying Horses, Monkey Trail and a lot more to enjoy. We rode a tourist bus in Safari Park. There we saw a group of baboons, lions and white tigers. We ended our day buying various souvenir items in the souvenir shop. After we performed, we changed our costume to evening dress and mingled with the Taiwanese staff and officers. We even participated in their games on stage. It was a good experience dealing with them though they cannot speak in English fluently; they are people who easily smile when greeted. This is our third time to perform and for sure this would be the last. 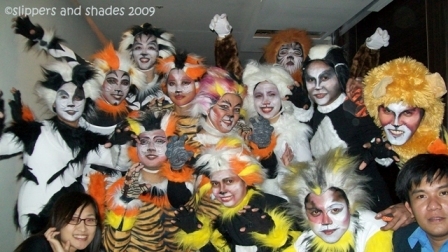 But one thing for sure, the memories of our CATS experience are something to be treasured and cherished by everyone. It’s such a wonderful feeling organizing a team where everyone cooperated well from the start of our practice which at times ended up almost midnight, from conceptualizing the costumes and make-up, the laughter, the snack and most of all the bonding which I could say is the best formula for winning. I will be missing our camaraderie. 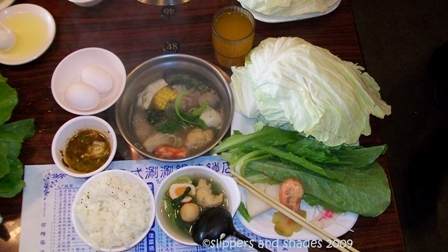 We ate healthy shabu-shabu in Cash Country for our lunch. The vegetables were all fresh. Pechay leaves were so big. What a nice lunch we had. That ends our Taiwan adventure. We were so thankful to our company for pampering us for six wonderful days. Hoping to get back here in the future!